Trying to pull my odd sized pieces together has been a challenge. I want them all to fit together visually, and have everything in a logical, relatively convenient place. 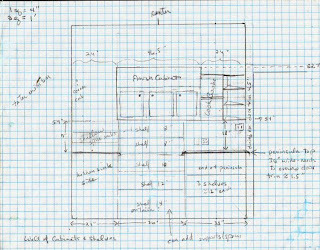 Figuring out the floor plan was a start. Figuring out how to incorporate my assortment of cabinets hasn't been as easy. I discovered it isn't just a matter of cabinet placement, but of where shelves, drawers, and doors need to go. Or not go. I can see how easy it would be to simply fill a blank space, without thinking through how convenient the arrangement would be in the long run. The only way I knew to start, was to make lists of my cookware, gadgets, and small appliances, and their measurements. 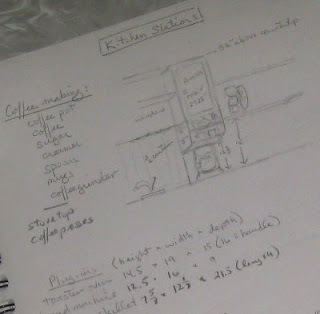 Inventorying my kitchen items trying to figure out where they'll go. cabinet area to the right of the sink. The advice to think in terms of kitchen stations has been helpful. It caused me to consider what items and ingredients I use together for various kitchen tasks. These are the things I want to keep near one another for convenient accessibility whenever possible. 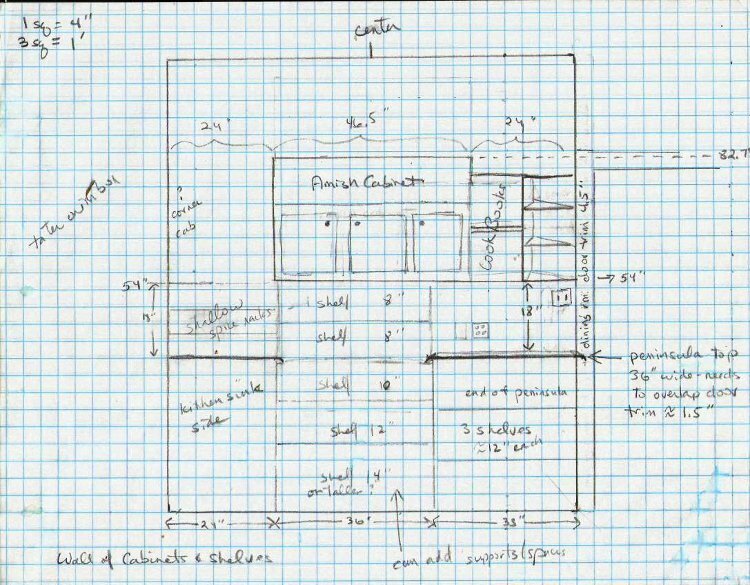 An idea for my wall of shelves (as per kitchen floor plan). 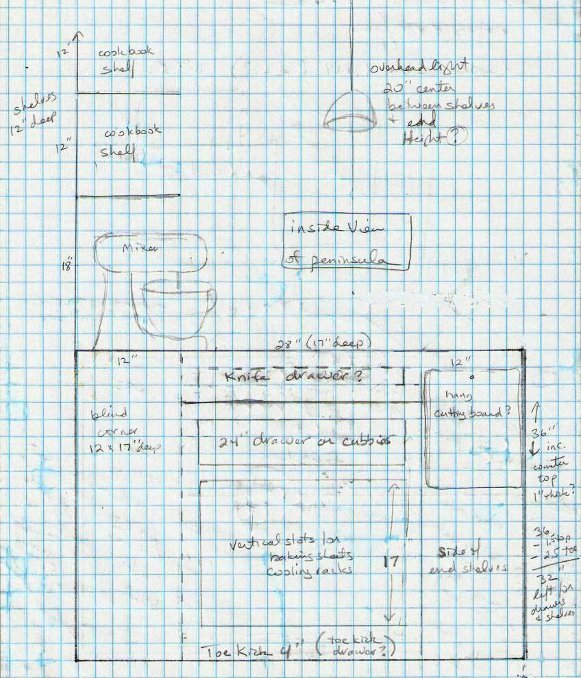 In addition to my own brainstorming, I am continually scouring kitchen design books, remodeling magazines, and the internet for ideas. I even asked ya'll about yours: I'm Curious About Your Kitchens. Possible idea for the near side of the peninsula. Fitting all the pieces together physically is one challenge. Pulling them together visually is another. I'm hoping overall theme, color, cabinet hardware, and countertops can achieve that. 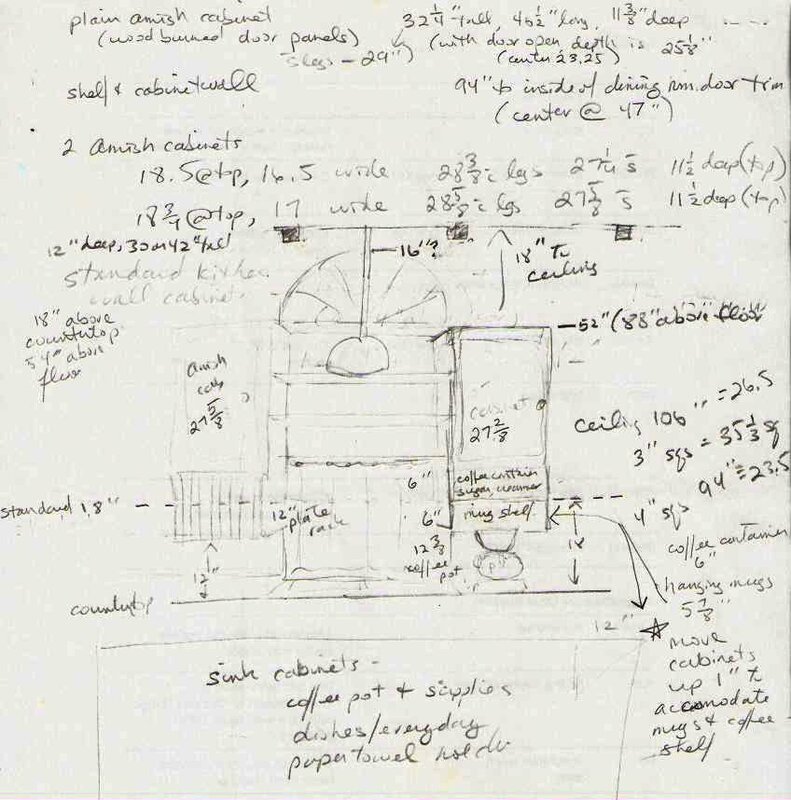 Expanding the idea for the kitchen sink area. It's like working out a puzzle, except that there is no right or wrong solution. In the end, it all boils down to space and personal preferences. Having an analytical bend, problem solving is the kind of thing I love to do. I have to admit though, that since the final choices are so subjective, there's always a big question mark in the back of my mind. 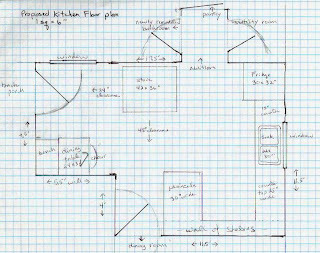 Leigh, I really enjoy your remodel blog posts...I wish I was as organized! You are so detailed and thorough! I can't wait for your kitchen to be completed...it is going to be so wonderful...a place for everything and everything in it's place...Nirvana! "I view my kitchen as a workshop, rather than a showpiece, entertainment center, or place to keep and heat food." One possible solution would be to tell the landlord about it. Offer to pay a portion of the replacement of the kitchen countertops. The advantage to him is that he gets a new kitchen countertops and gets help paying for it. Isn't it funny, how much we have to brainstorm to get to a point where our kitchens work for us. And what each person wants/needs is so different. Good luck with the designing! Lynda, you are so kind. I'm trying to be organized! I admit the whole process stumps me at times. We'll have to wait and see how successful I am! Dani, so glad to find a like-minded soul! One of the books I got from the library had a photo of Julia Child's kitchen in it. Quite a contrast from all the other showpiece kitchens in the book. 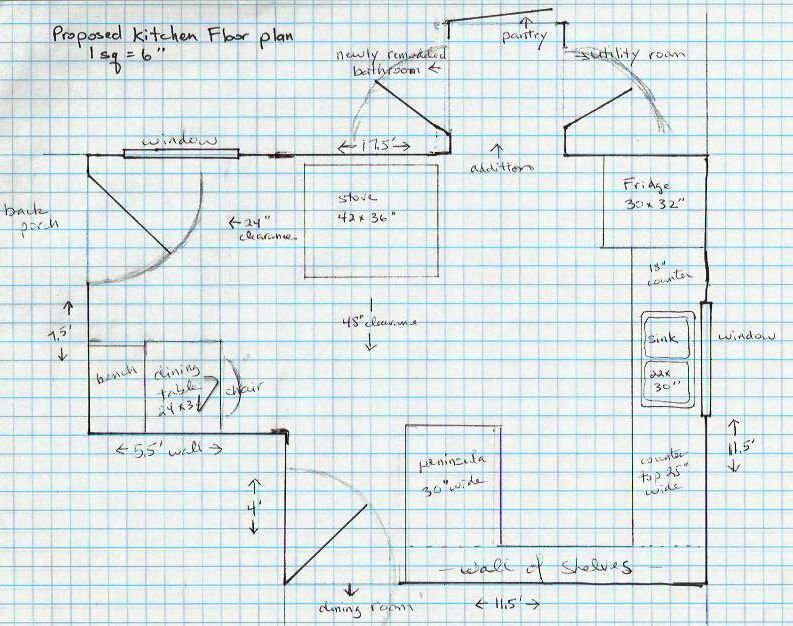 Mine won't be exactly like that, but it's something I keep in mind as I work out my kitchen plans. Charice, except that we have no landlord, this is our own place. Besides, I wouldn't go to all this trouble and expense for somebody else's kitchen! Stephanie, that is so true. Which is probably why the majority of folks want to remodel whatever kitchen they have. I read it's the number one area people want to change in their homes. There is no one-size-fits-all! Oh my, I guess you do like to analyze. I can't think of anything other than my sewing and weaving areas where I have come close to that type of analysis! I will say allow yourself options on heights and such. Just because item X looks like it will work in one place, you might find that intuitively you are wishing for it in another. I noticed counter to cabinet heights varied. Try to keep them all uniform and allow for the bigger things to fit in almost all places. IF you find a space that is not utilized that needs to be, you can always fill it in with smaller cubbies or hooks or narrow shelves for the small things and remember. I have many things that don't have a true home in my kitchen, they live in a cabinet specifically for large, bulky items or things with cords. I pull them out when I need them. It keeps my kitchen uncluttered except for the items I use daily or weekly. The only other piece of advice I can offer is put the pieces you love where you want them. Take everything else out of the plan and live with it for a week or two, if that means the pantry or a back room is stuffed to the gills so be it. As you need things and work in your renovated space ideas will come. A kitchen may be a work room, but it is also a place of great creativity. Allow that to happen also in your design and you will have a space that is both functional and beautiful. The best thing I did while designing our kitchen was insisting that there be outlets on the backside of my island. I've found these useful for blenders, misers, crock pots, electric tea pots, etc. There are two duplexes on mine and there have been times all four outlets have had things plugged into them - especially at family dinners. Theresa, it's true, I do. That's a good point about counter to cabinet heights. I've been doodling with these, and also noticing kitchens in books and magazines. Too often the homeowner seems to sacrifice counterspace to accommodate hutch style cabinets. I need my workspace! Uncluttered is my goal too, so I'm trying to think along the lines you mention. Good advice. Bettina, ah yes, tell the landlord. I've noticed that commenters whose real purpose is to promote their own sales website, usually don't really read what's actually going on. I suppose even a vaguely related comment is better than a blatant ad one (spam.) I always delete those. This one was so ridiculous though, that I couldn't help but respond to it. I am curious though, as to how much actual sales they get by annoying bloggers with their "comments." My way of thinking is that if they aren't interested enough to ascertain my needs, then they aren't the sort of business I'd bother with. Benita, outlets is exactly what we've been working on! Trying to figure them out that is. 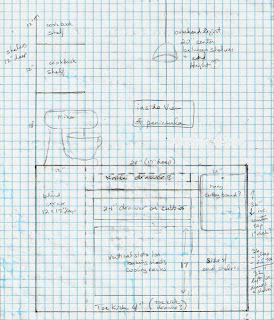 Since I don't have an island, and my peninsula will be relatively short (52"), I'm wondering if I can get away with a quad outlet in the wall it butts up against. 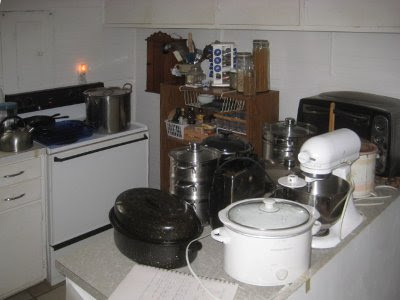 The mixer and toaster oven would use two, and that would leave two more for any electric appliance I might want to use. On the counter next to the window, I can't decide on a double or quad. Only the coffee pot would stay permanently plugged in. It wouldn't actually need to be, but the LCD clock is really handy. Bread machine would stay on that counter too, pushed back against the shelf wall, where I can pull it out to plug in to use as needed. I like the look of cabinets that don't match, it makes the kitchen more homey and the paint will certainly pull it all together. Thanks for sharing this process with us! I am lucky enough to have a finished basement and I store crockpots and roasters in a cabinet under the stairs which also serves as a pantry. I don't use them often enough to give up valuable real estate in the kitchen. One of the big things was to evaluate which items I really and truly used. The breadmaker was nice but the 3 times a year I used it to bake wasn't worth the space. The rest of the time I only mixed up dough and my mixer does a fantastic job and faster. I still make bread 3-4 times a week and we prefer the way I do it now. I kept only dishes I loved and they are the ones I use every day. My vintage bowls are used all the time as well. Nothing is sacred. It was worth the extra time and thought...we love it. There's one thing for sure, your kitchen will have been well thought out. I can't wait to see the end product. I know it's going to be great. I can't wait to see the finished kitchen!!! It's so hard to find a place to put those strange shaped kitchen items away. I have a cabinet in my basement for some of those. I would love a large pantry next to my kitchen!! Sherri, the more I look at photos of kitchens, the more I like that look too. I think it gives a kitchen more of a natural country look. Of course, we all have our different tastes! Val, now that's what I call thinking the process through intelligently. You input about appliances in of interest to me because I'm just putting the finishing touches on a post about my own kitchen appliances. I have to say that I wish we had a basement! but I think my pantry will help with any kitchen item overflow. I love that you thought it through and that it works for you. That's encouraging to me as well. Mrs Trixi, let's just hope I think through all the important things and don't forget any! Green Bean, I'm only organized on paper, LOL. 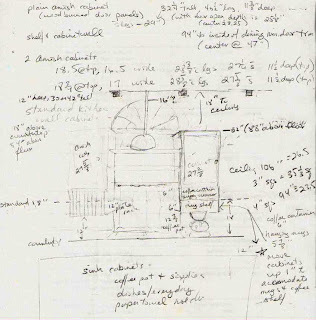 It does help to make lists, sketches, diagrams, and write things out. We finished a bathroom remodel last year and it was a lot of fun. I hope you enjoy your project as much as we do ours! Barb, me too! Not much progress on the visual front, because we've been working on getting the electric upgraded. Still, it gives me lots of time to think things through. And I do love my big pantry, though it's filled with kitchen overflow at the moment, LOL. With your great ability to research and study, plot and plan, the end result will be just right for YOU. And that's how it should be. I've always been puzzled by people who comment (in other peoples' kitchens) about one thing or another being in the totally "wrong" place. And "how can you function with this layout?" We women need to have our kitchens (more than any other room in the house) set up just exactly the way it works best for us. Mama Pea, aw, you make me blush. It seems to me that people who are happiest with their kitchens did just as you say, designed them for themselves. I look at kitchens in books and think "yuk," yet I know their owners are delighted with them. I reckon that's what makes it all so interesting. The different styles and preferences.